1) As a reagent free method of oxidation/reduction in organic synthesis. 2) Electroanalytical chemistry can be used to rank a series of drugs in their propensity to oxidation when considering their metabolic stability. The issue with electrochemistry of the past was the electrochemical technology. Traditional electrochemical equipment was developed by electrochemists for use by electrochemists. A chemist who wishes to use electrochemical techniques is interested in the product of the experiment and not in the electrochemistry itself. 1) ISSUE ONE - Large bulky potentiostats occupying too big a footprint on the bench space. 2) ISSUE TWO - Too many cables; traditional electrochemical experiments involve lots of trailing cables with often five or more cables including: working electrode, reference electrode, counter electrode. grounding cable, sensing cable. The issue is the cabling of an electrochemical experiment can be complex, and errors can take place. 3) ISSUE THREE - Traditional electrochemical experiments demand solution volumes of 5 ml to 100 ml. This is a real issue in applications such as medicinal chemistry where the compounds are always scarce. 4) ISSUE FOUR - Electrochemists are often using aqueous solutions whilst chemists, organics chemists/synthetic chemists are often using organic solvents. The issue is that the materials used in traditional electrochemical experiments may not always be resistant to organic solvents. The Modern Approach to Organic Electroanalytical Chemistry. 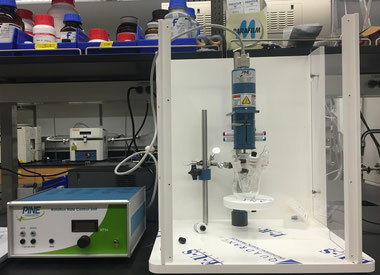 Though Zimmer and Peacock are steeped in the traditions of electrochemistry our team have also had careers within the pharmaceutical industry, and so it is from this dual perspective that we provide the AnaPot for organo-electroanalytical chemistry. 1) SOLUTION ISSUE ONE - The AnaPot is super lightweight and can be placed in the hand and carried around. 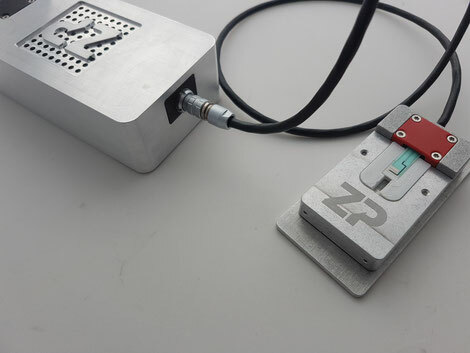 2) SOLUTION ISSUE TWO - With ZP there are not cables to the working electrode, counter electrode and reference electrodes. 3) SOLUTION ISSUE THREE - The technology from Zimmer and Peacock can perform an electroanalytical analysis on 100 microliters or less of solution. 4) SOLUTION ISSUE FOUR - ZP has built the AnaPot with organic solvents in mind so the technologies are tested against aggressive solvents such as DMF etc.